April 23, 2014 - My Tesslor R-601S is back back from the factory with an upgrade that add Bluetooth 3.0 capability and an improved sound board. See my review of the Bluetooth-enabled Tesslor R-601S with a new video. In 1983, my wife, Melanie, gave me a 1941 vintage floor model Crosley radio that my sister, Gayle, found in a barn on the Eastern Shore of Maryland. It was in pretty rough shape; after totally restoring and painting the metal parts and stripping down and refinishing the wooden parts, it looked pretty darn good (see picture). Unfortunately, I do not have any pictures of the electronics. Amazingly, in 1983 the local Radio Shack still had a vacuum tube tester in the store, so I was able to identify and replace the weak ones. I got rid of the old paper capacitors, gave everything a good look-over, then cautiously plugged it in. After a few moments the tubes began to glow a warm orange color and the very large single speaker began humming a 120 Hz tune. There was life in it - with no smoke! I selected the AM button from amongst an array of shortwave bands. All the familiar local AM stations easily tuned in, albeit with that ever-present hum. 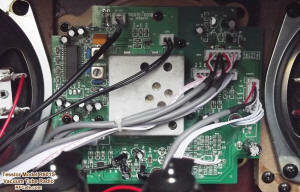 The radio's speaker did not use a permanent magnet, but had an electromagnetic one instead; another bad capacitor was the culprit. Melanie and I decided to give it as a wedding present to a relative who had a Victorian decor in the house, figuring that some day I would find another radio and restore it. Disappointingly, that relative got divorced and her husband took the radio and gave it to his son. All my hours of restoration effort was gone down the drain for the sake of some guy who has probably sold the radio by now. 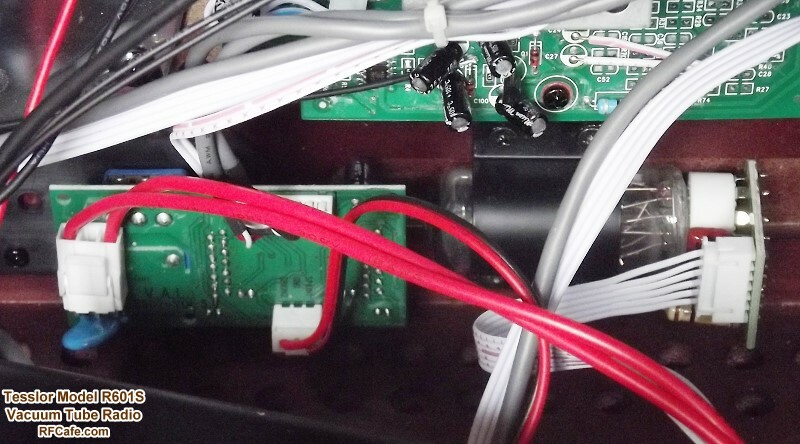 Since then, there has not been a lot of spare time to search for another radio, and even if one was located, there was equally little time to devote to a restoration project. Earlier this year I really started pining for a vacuum tube radio. After a little poking around on eBay, it became clear that buying something like that sight-unseen was too risky for the money people were asking for anything in halfway decent shape. So, I began looking to determine whether anyone offered a newly manufactured line of vacuum tube radios. There is a surprising selection available, but most are very expensive. The one I finally settled on was the Model R601S from Tesslor. 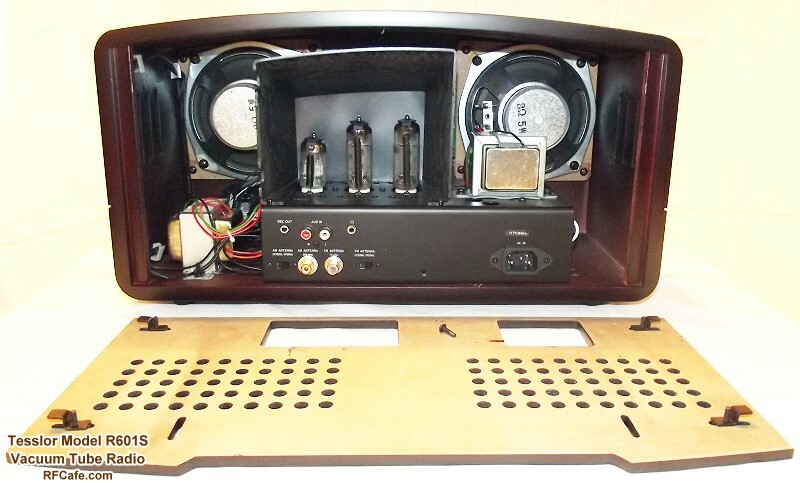 It has the advantage of employing a fully solid state front end and tuner, with vacuum tubes being used in the audio output amplifier stages. A single 6N2 tube provides preamplification, and each of the left and right speaker driver channels uses a 6P1 tube. Many serious audiophiles claim that there has never been a solid state audio circuit designed that can faithfully replicate the "warmth" of a tube circuit. Supposedly the mechanical vibrations within the tube elements are responsible for the quality. My hearing is pretty darn acute (unlike my eyesight), but I cannot claim to be able to tell the difference. My motivation is purely from a nostalgic craving for a tube set. Oh, the R601S does have a fourth vacuum tube that is mounted in the front of the radio case beneath the tuning dial. It is roughly the equivalent of the old "cat's eye" light used for fine tuning. In this case, it indicates when an FM station's signal is being properly resolved into separate right and left channels for stereo. 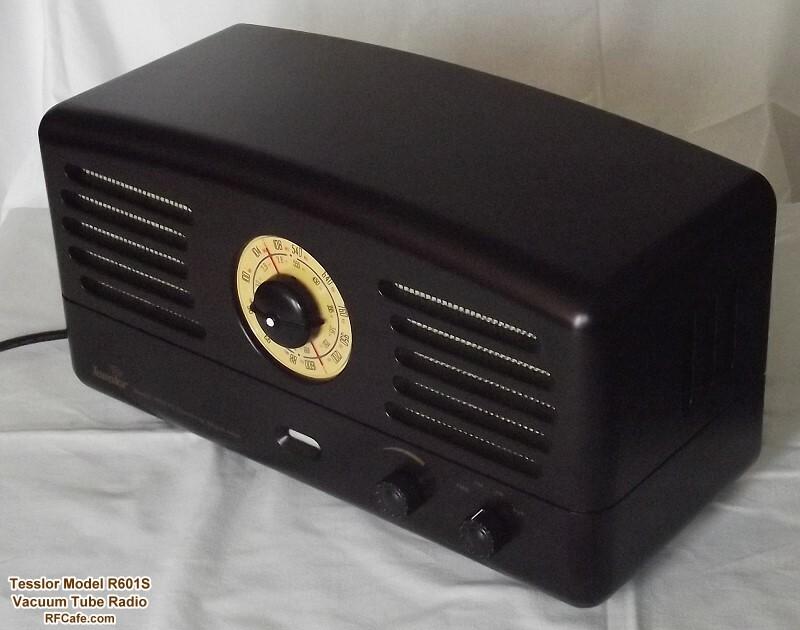 If you also desire to have a fine looking tabletop electron tube radio for your home or office, I can strongly recommend the Tesslor Model R-601S. It has a monaural version, the Tesslor Model R-601 (no "s" on the end). The stereo model is fairly large at 17" x 8.5" x 7", so if you have more limited space, the mono version will probably fit at only 12" x 8.5" x 9". 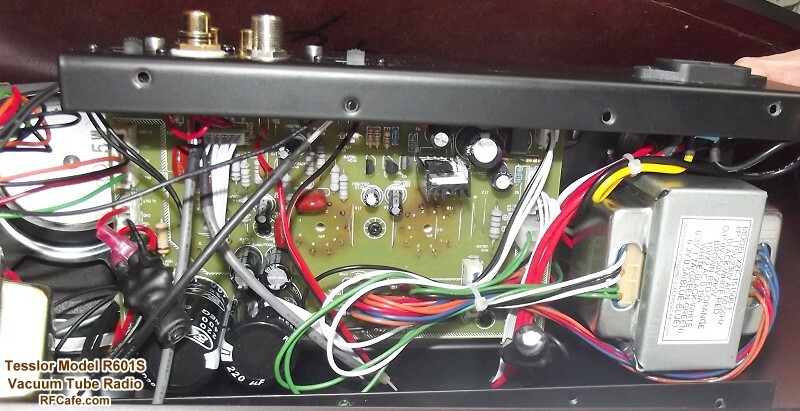 If you are anything like me, you would really like to have a look at the "guts" of the radio before making a decision whether or not to buy it. I did not have that option, but now you do. At the risk of voiding the warranty, I opened my R-601S and took some photos. Not only that, but to whet your appetite even more, I made a short video showing the tubes warming up and the "cat's eye" doing its thing during tuning. The radio's case is a thick MDF type material with a dark, smooth, rubbed-in finish. Cloth with a classic look covers the front of the twin speakers. The tuning dial is illuminated from behind to produce a glowing, yellowish hue. Other than the tuner, the only other adjustments are the on/off/volume knob and the AM/FM/FMst/AUX selector knob. (2) this device must accept any interference received, including interference that may cause undesired operation." Now there is something an authentic vintage radio would not have on it. However, it is not because Part 15 did not exist early on. According to an article I found titled, "Unlicensed to Kill: A Brief History of the FCC's Part 15 Rules," Part 15 was established way back in 1938, but did not really get much attention until a major revision was issued in 1989 to deal with the surging popularity of RF-generating consumer and industrial products. 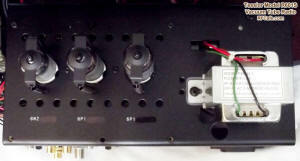 Removal of the back panel requires loosening four screws to allow the retainer clips to slide inward. That helps keep you from losing the screws. There is a fifth screw which is not captive, so the designers must have figured you can afford to lose that one as long as the others are intact. Providing for simple removal is important because unlike the vast majority of electronics you buy these days, there are user serviceable parts inside. That's right, the 6N2 (actually 6N2P-EV) triode and 6P1 (actually 6P1P-EV) tetrode vacuum tubes have a rated service life of 1,000 to 2,000 hours, so if you listen to your R601S often, be prepared to eventually replace one or more tubes. They cost around $1.50-$2.00 each from suppliers on eBay. The 6E2 "Magic Eye" tube costs a whopping $5.00. If you don't trust eBay vendors, you can always pay a lot more from companies easily located with a Google search. There really is nothing remarkable about the printed circuit assembly, which is probably a good thing. There are lots of connectors and wires running to and from the PCB. But, wait until you see the underside of the chassis section that holds the vacuum tubes. With three large multi-tap transformers reminiscent of the old tube sets, there are plenty of wires to go around. 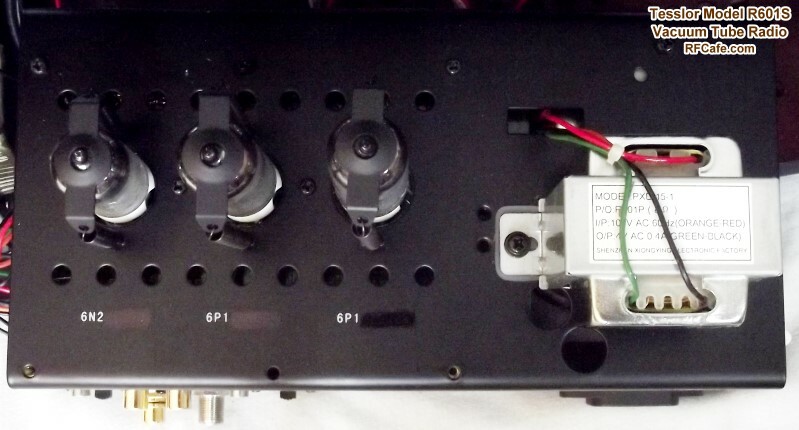 Unfortunately, the tube bases are soldered to a printed circuit board; I was hoping to find the traditional point-to-point wiring from each of the socket pins. Oh well, you have to save money where you can. 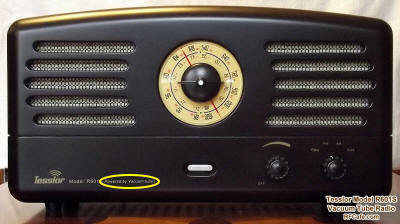 As mentioned earlier, the R601S provides not only AM and FM radio reception, but also has an auxiliary input port. I have an audio cable running from my desktop computer over to the radio so when the mood hits, I can fire up Rhapsody and play some moldy oldies and wax nostalgic for the days of carefree youth-ness. Yes, a large portion of radios were transistorized by the late 1960s and 1970s when I began really listening to music on the radio, but I lived in a household that didn't have a color TV set until sometime in the 1970s and routinely ran out of heating oil in the winter, so we were a bit late with technology. Tube sets were de rigueur at 114 River Road in Mayo, Maryland. 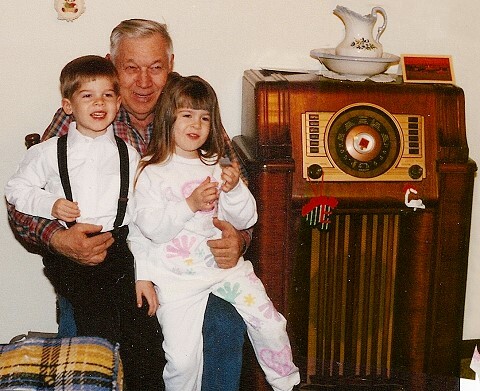 In fact, I can remember waiting for the radio to warm up in my father's 1950-something Rambler that had a push-button transmission - in the early 1970s - and it wasn't because he was an antique car collector. The stars of the show are the three tubes sitting atop the metal chassis. Silkscreening near the tubes identify the 6N2 and 6P1 part numbers, but if you notice, there are blacked out characters that alternately call for a 6DJ8 in place of the 6N2 and for an EL84 pentode in place of the 6P1, although it appears the EL90 pentode is the true equivalent. BTW, for those not familiar with vacuum tubes, the "6" at the beginning indicates a 6.3 volt filament voltage. 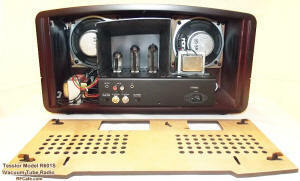 To the left is a shot of the 6E2 "magic eye" tube that is viewed from the front of the radio. As mentioned earlier, I still want to eventually find another floor model tube set, but at least now I have a high quality model, complete with a 1-year warranty, to listen to in the mean time. Oh, and if you love a lot of bass content in your music, you'll really love this radio.